Ruling-party candidate Dilma Rousseff won Sunday’s presidential runoff in Brazil and is to become the country’s first-ever female president, according to official results. With close to 95 percent of the votes counted, Rousseff had over 55 percent of the valid ballots, compared to 44 percent of her rival, social democrat Jose Serra. Her election means a continuation of the policies of popular President Luiz Inacio Lula da Silva, who nominated his one-time chief of staff as the candidate of his Workers’ Party (PT). Earlier, an exit poll made by the private Brazilian Institute of Public Opinion and Statistics (IBOPE) estimated that Rousseff would get 58 percent of the valid votes to Serra’s 42 percent. 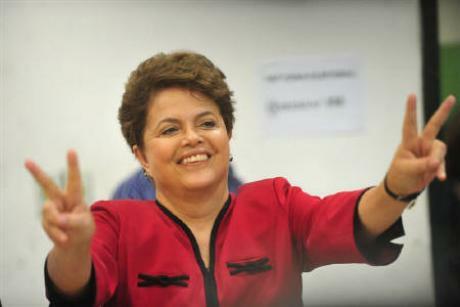 If the results are eventually confirmed, Rousseff, 62, would be inaugurated Jan 1 with a four-year mandate. Rousseff already comfortably won the first round of the presidential election Oct 3 with 47 percent of the votes, but fell short of the more-than-half of all votes requirement to avoid a runoff. An economist by training, she once also trained as a guerrilla fighter during Brazil’s military dictatorship, and later made her mark as Brazil’s energy minister and government chief of staff under Lula. The hugely popular Lula, 65, is barred from serving more than two consecutive terms. He however pulled his weight behind Rousseff, who has vowed to build on her mentor’s legacy. Previous: Top 10 dream companies to work for?